The team arrived to Guatemala City 2/16 and then we boarded two buses for a 3 and half hour drive that took 5 hours because of the traffic to IRTRA, San Martin. 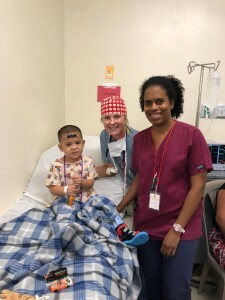 The next day, we woke up early, had devotional, breakfast, and headed to Hospital Hilario Galindo for orientation and to clean and set up the ORs and PACU. Team Mann consisted of 49 members which were part of a dental team, surgical team and wheelchair clinic team. I was part of the surgical team and I worked in the PACU. We did surgeries from Monday until Thursday. Our surgical team saw 80 patients and performed 124 procedures. In the PACU, there were 4 nurses, including myself, working together. As the 4 person team, we recovered over 100 patients in the recovery room. It was exhausting work, but oh so worth it. Our dental team saw 80 patients and had 22 surgical procedures. And finally our wheel chair team saw 126 patients, distributed 119 wheelchairs, and built 134 wheelchairs. On Tuesday, February 19th, I took care of an 8 year old boy after his surgery. He did great after his procedures and the mom and uncle came to see after the surgery. The mom and uncle kept thanking me for the taking care of their child. It was the sweetest! The hospital nurse and I took the patient to his inpatient room and I said good bye to the patient’s mother and uncle. The next day, on Wednesday, I was called out of the recovery room by one of the team members. I come out of the recovery room to find the patient’s uncle outside with a Guatemala crossbody bag for me. He said “I wanted to say thank you again for taking care of my nephew and I am so grateful so team that came here and helped him.” That really touched me!! It was the sweetest thing. For me, it showed me that the Guatemalans may not have much according to our “standards”, but they are willing to give you anything for providing them medical care. I tell all my friends that they should go on a medical mission trip. It gives you a whole NEW perspective on healthcare and taking care of patients and yourself.